The fluid body is one of the great discoveries in the craniosacral approach to treatment and health. As the body structure reorganizes through a listening/receptive touch, the fluid body starts to show itself. This often begins as fluctuations in the background leading eventually to structure seeming to dissolve and melt into a fluid state that becomes the perceptual foreground. This is just how it feels to the therapist, like the solid material of the body has changed form and softened to fluid structure. Once this process starts, the melting ripples through the whole body turning the body into a fluid bag with only a dim sense of structure within it. As real as the solid material of the body is to us and the solidity of nature generally, it seems that is just one reality which hides an inner world that is literally substantially different. The fact is we are mostly fluid. Most of our body is water based and when you are in relationship to this as a conscious experience your body feels lighter and more amorphous. There’s also an increased sense of wellbeing and energy. This can be a permanent state and not just a temporary state in a therapeutic treatment. The fluid state is our deeper nature. Life is experienced in a much more mobile way in this state of consciousness, the body becomes brighter and more intelligent as does the mind. The mind becomes creative, insightful and flowing. The way into this is to bring the autonomic nervous system into balance and create a homeostasis throughout all the body systems. Here’s a quick way to do that. Come into relationship with your slowest fluids, your lymph. Just relating to your lymph through felt sense awareness will slow your whole system down and bring an automatic shift to a hidden fluid state. The lymphatic system is working in the deep background of your consciousness and is so subtle and gradual that it’s a layer you rarely experience within your self. Here’s a guided exercise to bring you into lymph awareness and here’s a picture from Thieme’s Atlas of Human Anatomy to show you how ubiquitous it is. Thanks for this. I wouldn’t have thought it possible to get in touch with my lymphatic system! I was amazed that it really does produce instant settling in that is deeper than my normal grounding approach. Those polyp type shapes running down the centre, are imagistically exactly what I was trying to explain in training the other day. They were creating beat per second, rhythmic upward pulses through ‘fellow tutors’ body. Except on the left posterior side. 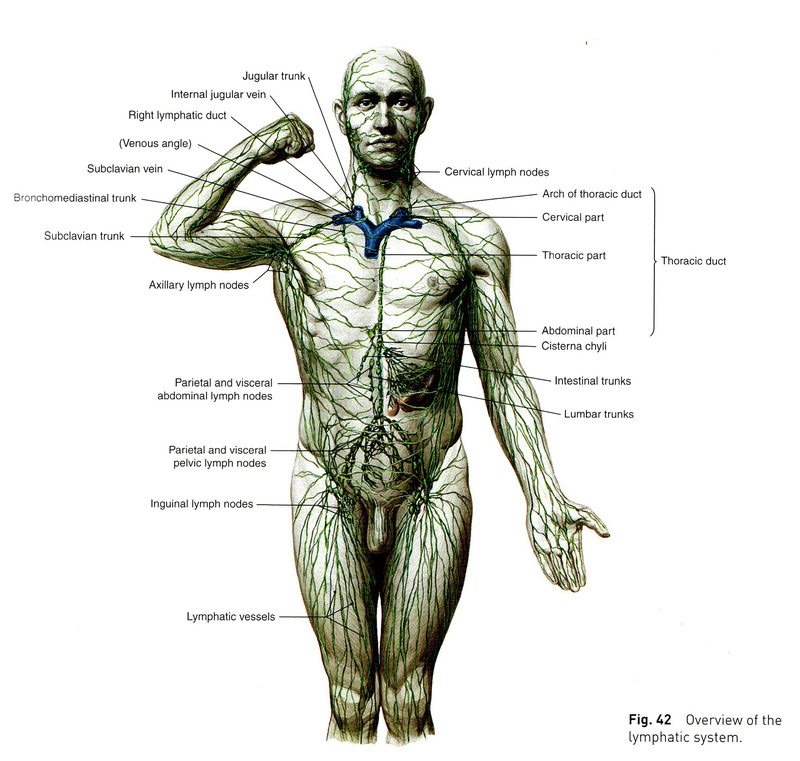 Perhaps the lymphatic system is what I was keying into…?